Kids and Breakfast: Why is it Important? Home > Teenager Nutrition > Kids and Breakfast: Why is it Important? Breakfast is the first meal of the day, and it really is the most important one, because it feeds the brain and body, and supports better eating habits. Encouraging children to eat breakfast can be difficult, but they are more likely to eat a good breakfast if they are set an example by their parents, and if they can have a hand in the planning and preparation. Some schools have a breakfast club for children who can’t have breakfast before they leave in the morning. The body uses up its energy stores overnight, and breakfast refills these stores. Children who don’t have breakfast will run out of energy partway through the morning, making them tired and irritable. In the long term, children who have breakfast tend to have lower cholesterol levels and fewer problems with weight. If children are tired and hungry, they find it harder to concentrate and are more likely to misbehave. 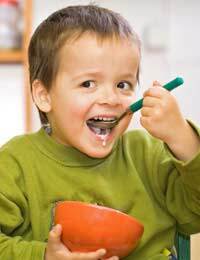 A study in the American Journal of Clinical Nutrition showed that children found it harder to learn if they did not have breakfast. The 1997 State of Minnesota Breakfast Study showed that children who ate breakfast were more likely to do well in maths and reading tests, found it easier to concentrate, had better attendance records, were less likely to go to the school nurse with stomach aches, and behaved better. Children who have a good breakfast tend to eat more healthily during the rest of the day. Having a good breakfast stops the hunger pangs halfway though the morning, reducing the risk of children filling up on crisps, chocolate and sweets at morning break. Toast is a traditional breakfast – wholemeal or granary toast keeps children feeling full for longer and provides them with fibre, vitamins and minerals. Toast can be topped with anything from marmite, low sugar jam or fruit spread to sliced banana and cinnamon, soft cheese and pineapple or peanut butter and raisins. Cereal also makes a quick, easy and filling breakfast, but avoid the sugary ones as these aren’t very good for either the teeth or the waistline, and can provide a quick boost of energy that soon goes. In the winter, a hot breakfast, like boiled eggs, beans or scrambled eggs on toast, porridge, or cereal with hot milk is a good way to warm up before going out in the cold. Breakfast doesn’t have to be just cereal or toast – children who don’t like traditional breakfasts could have fruit and yoghurt, cold meat and low-fat cheese, sandwiches on wholegrain bread, pasta, or even leftovers from the night before. Pastries and croissants are a great treat for breakfast, but shouldn’t be for every day! A glass or fruit juice provides one of the five a day or a glass of milk keeps calcium and vitamin D levels up, and is especially good for children who just can’t face breakfast. Other options for the child who doesn’t want breakfast would be a fruit and cereal bar (but watch the levels of fat and sugar), or a fruit smoothie.